On rail, beneath music book held by woman: "G. Honthorst fe. 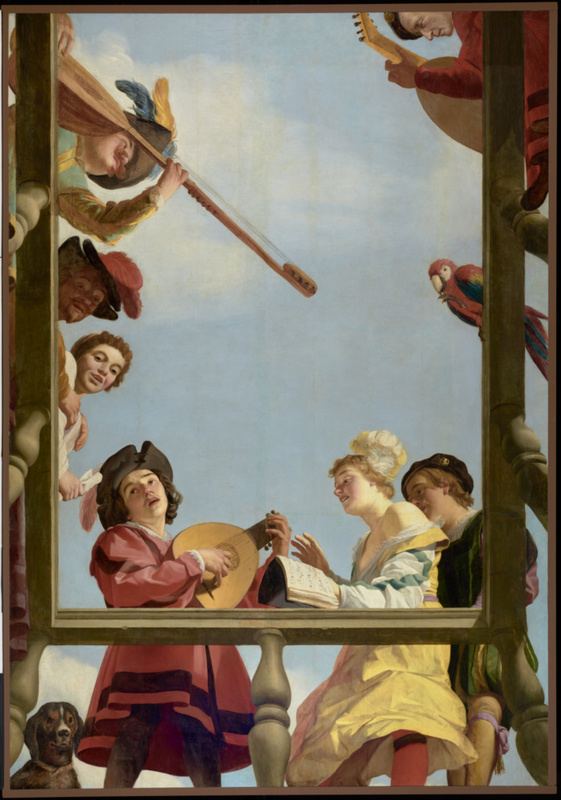 1622"
Smiling, singing figures gather around a balcony to play musical instruments, inviting the viewers below to join in the fun. The revelers' facial expressions and bright colorful clothes heighten the festive, carefree mood. A parrot and a dog, gazing down from their perches, round out the merry group. Possibly part of an allegory of Harmony, the painting may have originally been slightly wider and twice as long, containing a complete balustrade and more figures. The head of the man at the top is a modern addition. Gerrit van Honthorst painted this illusionistic ceiling, the earliest of its type made in the Netherlands in 1622, two years after his return from Italy, where he saw similar painted ceilings. Careful calculation of perspective allows the figures to burst plausibly through the flat plane of the painted panel. Source: De Meyere, J. A. L. "Nieuwe gegevens over Gerard van Honthorst's beschilderd plafond uit 1622." Jaarboek Oud-Utrecht (1976), pp. 17-22. Source: De Meyere, J. A. L. "Nieuwe gegevens over Gerard van Honthorst's beschilderd plafond uit 1622." Jaarboek Oud-Utrecht (1976), p. 17. Source: L'Hotel de Ventes Doelenstraat, Amsterdam. Antiquités- objets d'art [...]. November 25-28, 1924, unpaginated, lot 909. Source: S. J. Mak van Waay, Amsterdam. Schilderijen, antiquiteiten, oosterse tapijten. October 4, 1949, p. 11, lot 43. Source: De Meyere, J. A. L. "Nieuwe gegevens over Gerard van Honthorst's beschilderd plafond uit 1622." Jaarboek Oud-Utrecht (1976), p. 17n36. Possibly Alexander Korda, Hungarian, 1893 - 1956 (London, England), possibly by inheritance to his wife, Alexandria Irene Boycun, 1956. Source: Drazin, Charles. Korda: Britain's Movie Mogul (London: I.B. Tauris, 2011), p. 358. Francis Stonor, British, died 1968 (London, England), by inheritance to his cousin, Thomas Stonor, 1968. Source: "A Taste for Splendour: and Mr. Francis Stonor." The Conoisseur 144, no. 582 (January 1960), p. 216. Source: Christie's, London. Catalogue of Important Pictures by Old Masters. April 10, 1970, p. 50, lot. 88, ill.
L'Hotel de Ventes Doelenstraat, Amsterdam. Antiquités- objets d'art. November 25-28, 1924, unpaginated, lot 909. S. J. Mak van Waay, Amsterdam. Schilderijen, antiquiteiten, oosterse tapijten. October 4, 1949, p. 11, lot 43. Mostra del Caravaggio e dei Caravaggeschi, exh. cat. (Milan: Palazzo Reale di Milano, with Sansoni Editore, 1951), p. 70, no. 120, fig. 89. Gerson, Horst. "Die Austellung Caravaggion und die Niederländer." Kunstchronik 5 (November 1952), p. 289. Hess, J. "Die Gemälde des Orazio Gentileschi." In English Miscellany: A Symposium of History, Literature and the Arts. Mario Praz, ed. (Rome: Edizioni di Storia e Letteratura, 1952), vol. 3, p. 179. Nicolson, Benedict. "Caravaggio and the Netherlands." The Burlington Magazine 94, no. 594 (September 1952), p. 251n14. Caravaggio en de Nederlanden, exh. cat. (Utrecht: Centraal Museum, 1952), pp. xxvi, 31, no. 45. Zeri, Federico. "The Pallavicini Palace and Gallery in Rome I: The Palace." The Connoisseur 136, no. 549 (December 1955), p. 186. Isarlo, George. Les Indépendants dans la peinture ancienne (Paris: La Bibliothèque des Arts, 1956), pp. 133-34. Nicolson, Benedict. Hendrick ter Brugghen (London: Lund Humphries, 1958), p. 107, under no. A74. Judson, J. Richard. Gerrit van Honthorst: A Discussion of his Position in Dutch Art (The Hague: Martinus Nijhoff, 1959), pp. 65n3, 68n4, 74, 106, 112, 123, 126, 248-49, no. 198, fig. 24. Fremantle, Katherine. The Baroque Town Hall of Amsterdam (Utrecht: Heantjens Dekker & Gumbert, 1959), p. 136n2. "A Taste for Splendour: and Mr. Francis Stonor." The Connoisseur 144, no. 582 (January 1960), p. 216. Stechow, Wolfgang. "Gerrit van Honthorst: A Discussion of His Position in Dutch Art by J. Richard Judson." The Art Bulletin 43, no. 4 (December 1961), p. 339. Braun, Hermann. "Gerard und Willem van Honthorst." Ph.D. diss. (University of Göttingen, 1966), pp. 158-59, no. 32. Snoep, D. P. "Honselaersdijk: Restauraties op papier." Oud Holland 84, no. 4 (1969), p. 289. Christie's, London. Catalogue of Important Pictures by Old Masters. April 10, 1970, p. 50, lot. 88, ill.
Fredericksen, Burton B. Catalogue of the Paintings in the J. Paul Getty Museum (Malibu: J. Paul Getty Museum, 1972), p. 75, no. 92, ill.
Reznicek, E. K. J. "Hont Horstiana." Nederlands Kunsthistorisch Jaarboek 23 (1972), pp. 172-75, figs. 3, 4. Fredericksen, Burton B., ed. The J. Paul Getty Museum: Greek and Roman Antiquities, Western European Paintings, French Decorative Arts of the Eighteenth Century (Malibu: J. Paul Getty Museum, 1975), pp. 71, 112, 113, ill.
Fredericksen, Burton B., et al. Guidebook: The J. Paul Getty Museum. 3rd ed. (Malibu: J. Paul Getty Museum, 1976), pp. 55-56. De Meyere, J. A. L. "Nieuwe gegevens over Gerard van Honthorst's beschilderd plafond uit 1622." Jaarboek Oud-Utrecht (1976), pp. 7-29, ill.
Rosenberg, Jakob, Seymour Slive, and E.H. ter Kuile. Dutch Art and Architecture: 1600 to 1800, 3d ed. (New York: Penguin Books, 1979), p. 42. Egerman, Bonnie Lynn-ellen. "The Drawings of Gerrit Van Honthorst. A Study of Stule, Iconography and Relationship to Contemporaries." M.A. thesis (University of California, Santa Barbara, 1977), pp. 10, 55, 96n40. "Rectificatie." Maandblad Oud-Utrecht 50, no. 2 (February 1977), p. 17, ill.
Fredericksen, Burton B., Jiří Frel, and Gillian Wilson. Guidebook: The J. Paul Getty Museum. 4th ed. Sandra Morgan, ed. (Malibu: J. Paul Getty Museum, 1978), p. 69. Nicolson, Benedict. The International Caravaggesque Movement: Lists of Pictures by Caravaggio and His Followers throughout Europe from 1590 to 1650 (Oxford: Phaidon, 1979), p. 59, figs. 157, 158. Terwen, J.J. "Johann Moritz und die Architektur." In Soweit der Erdkreis reicht: Johann Moritz von Nassau-Seigen, 1604-1679, exh. cat. (Kleve: Städtisches Museum Haus Koekkoek,1979), p. 130. Fredericksen, Burton B. Masterpieces of Painting in the J. Paul Getty Museum (Malibu: J. Paul Getty Museum, 1980), unpaginated, no. 30, ill.
Fredericksen, Burton B., Jiří Frel, and Gillian Wilson. The J. Paul Getty Museum Guidebook. 5th ed. (Malibu: J. Paul Getty Museum, 1980), p. 53. Bissell, R.W. Orazio Gentileschi and the Poetic Tradition in Caravaggesque Painting (London: Pennsylvania State University Press, 1981), pp. 68-69, fig. 178. Boer, Breedvelt I. M. Plafonds in Nederland, 1300-1800 (The Hague: 's-Gravenhage, 1991), pp. 53, 110n134, fig. 119. Döring, Thomas. Studien zur Künstlerfamilie Van Bronchorst: Jan Gerritsz. (ca. 1603-1661), Johannes (1627-1656) und Gerrit van Bronchorst (ca. 1636- 1673) in Utrecht und Amsterdam (Alfter: VDG Verlang, 1993), pp. 51, 68n180. Huisken, Jacobine, Koen Ottenheym, and Gary Schwartz. Jacob van Campen: Het klassieke ideaal in de Gouden Eeuw (Amsterdam: Architectura & Natura Pers, 1995), pp. 132, 257n60, fig. 98. Slatkes, Leonard J. "Gerrit van Honthorst." The Dictionary of Art. Jane Turner, ed. Vol. 14 (New York: Grove, 1996), vol. 14, p. 729, fig. 3. Seelig, Gero. Abraham Bloemaert (1566-1651): Studien zur Utrechter Malerei um 1620 (Berlin: Gebr. Mann, 1997), pp. 195n446, 199-200, 312, 394-95, no. F42, fig. 54. Spicer, Joaneath A., and Lynn Federle Orr, eds. Masters of Light: Dutch Painters in Utrecht During the Golden Age, exh. cat. (Baltimore: The Walters Art Gallery, with Yale University Press, 1997), p. 111, fig. 15. Janssen, Paul Huys. Jan van Bijlert, 1597/98-1671: Catalogue Raisonné (Amsterdam: John Benjamins Publishing Company, 1998), p. 154n2, under no. 145. Weller, Dennis P. Sinners & Saints: Darkness and Light; Caravaggio and His Dutch and Flemish Followers, exh. cat. (Raleigh: North Carolina Museum of Art, 1998), p. 222, fig. 7. Helmus, Liesbeth M. De Verzamelingen van het Centraal Museum Utrecht: Schilderkunst tot 1850 (Utrecht: Centraal Museum Utrecht, 1999), pp. 43-44, fig. 11. Judson, J. Richard, and R.E.O. Ekkard. Gerrit van Honthorst, 1592-1656 (Doornspijk: Davaco Publishers, 1999), pp. 21, 223-24, no. 286, fig. 171. Liedtke, Walter. Vermeer and the Delft School (New York: Metropolitan Museum of Art, 2001), pp. 120-21, fig. 130. Bikker, Jonathan, Gianni Papi, and Nicola Spinosa. French, Dutch and Flemish Caravaggesque Painting (Milan: Collezione Koelliker, 2005), pp. 22, 24n6. De Meyere, Jos. Utrechtse schilderkunst in de Gouden Eeuw: Honderd schilderijen uit de collectie van het Centraal Museum te Utrecht (Utrecht: Uitgeverij Matrijs, 2006), pp. 130, 131, 430n4, under no. 28, fig. 28.2. Slatkes, Leonard J., and Wayne Franits. The Paintings of Hendrick ter Brugghen, 1588-1629: Catalogue Raisonné (Amsterdam: John Benjamins Publishing Company, 2007), pp. 210, 211n6, 212, 213n4, under nos. A88 and A89. Doherty, Tiarna, and Anne T. Woollett. Looking at Paintings: A Guide to Technical Terms. Rev. ed. (Los Angeles: J. Paul Getty Museum, 2009), pp. 14-15, ill.
Franits, Wayne. "Laboratorium Utrecht: Baburen, Honthorst und Terbrugghen im künstlerischen Austausch." In Caravaggio in Holland: Musik und Genre bei Caravaggio und der Utrechter Caravaggisten, exh. cat. (Frankfurt: Städel Museum, 2009), p. 52n17. Sander, Jochen, Bastian Eclercy, and Gabriel Dette. Caravaggio in Holland: Musik und Genre bei Caravaggio und den Utrechter Caravaggisten, exh. cat. (Frankfurt: Städel Museum, 2009), pp. 103, 170, under no. 34, ill.
Ausoni, Alberto. Music in Art. Stephen Sartarelli, trans. (Los Angeles: J. Paul Getty Museum, 2009), p. 192, ill.
Zuccari, Alessandro. I Caravaggeschi: Percorsi e protagonisti. 2 vols. (Milan: Skira, 2010), vol. 2, pp. 467-68, fig. 6. Franits, Wayne. The Paintings of Dirck van Baburen ca. 1592/93-1624: Catalogue Raisonné (Philadelphia: John Benjamins Publishing Company, 2013), pp. 44n239, 134, under no. A24. Ebert, Bernd, and Liesbeth M. Helmus, eds. Utrecht, Caravaggio and Europe, exh. cat. (Munich: Hirmer, with Centraal Museum and Alte Pinakothek, 2018), pp. 236, 240, fig. 95, under nos. 66-67, entry by Bernd Ebert.